If you visit the Tangerine Facebook page (like I did), you will be overwhelmed by the number of daily specials there are – quite literally every day of the week apart from Sundays. If that isn’t enough to draw you to this restaurant, then perhaps the super-friendly staff, or the decent food (at a price that is kind to your wallet) will. Myself and a couple of girlfriends chose to go to Tangerine on a Wednesday – that would be “free welcome drink day” – Thai Mohitos that started us off quite nicely. They carried us through as well – we had two each and both were complimentary. I’m not sure if that was a normal thing, or if they just liked us. Either way, we were off to a good start! 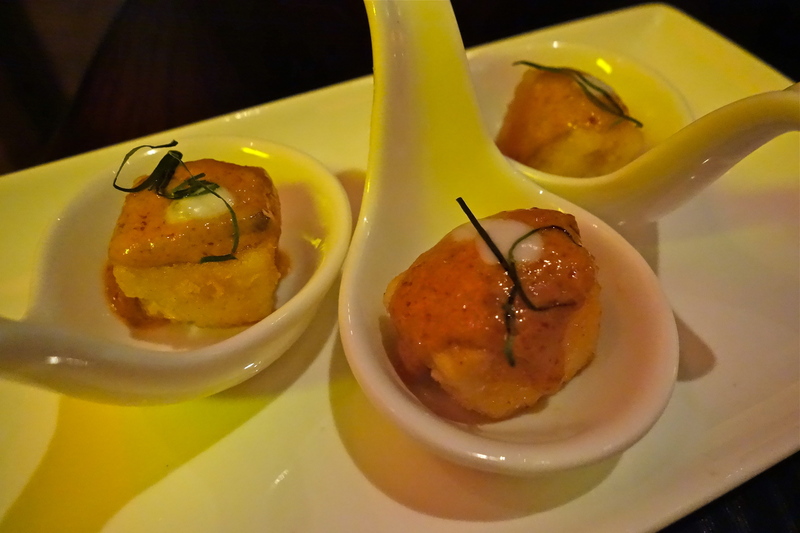 I don’t think I have ever been served an amuse bouche at a Thai restaurant before, but these ones, small cubes of fried tofu topped with a mildly-spiced curry sauce, pleasantly piqued my appetite for more. As an amuse bouche, they served their purpose! 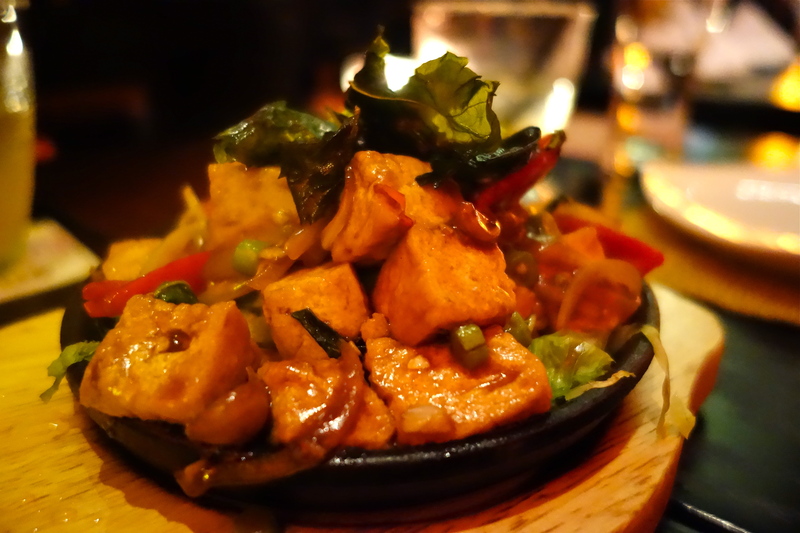 For our ‘something healthy’, we opted for the sizzling deep-fried tofu with basil and chili (who were we kidding, right? Ha – let’s call it relatively healthy). The portion was generous, a mound of tofu mixed with chilies, fried basil, chopped beans, lettuce and onions, thinly covered in a sweet-sour dressing. The prawns also went down a treat – what can I say, we like things that sizzle! 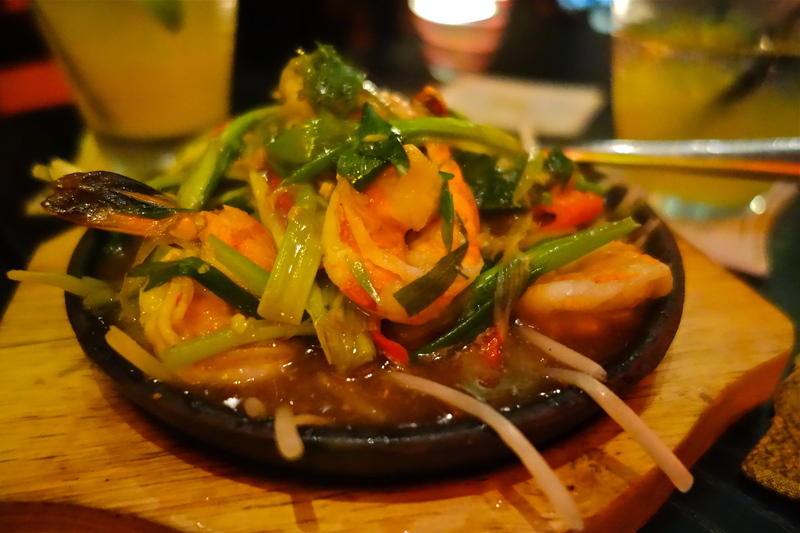 Large meaty prawns served on a sizzling cast-iron plate, mixed in with lots of beansprouts and spring onions. There are a few dishes that really demonstrate just how good a Thai restaurant is in my book, and I always rate restaurants with their peers according to these dishes: Thai Beef Salad, Tom Yum Kung and Pad Thai. I know there are many, many other dishes that could be on this list, but these are my benchmarks. Why? Because they are dishes that can be made oh so well (and when they are good, they are GOOD! ), but can also be very easily screwed up. 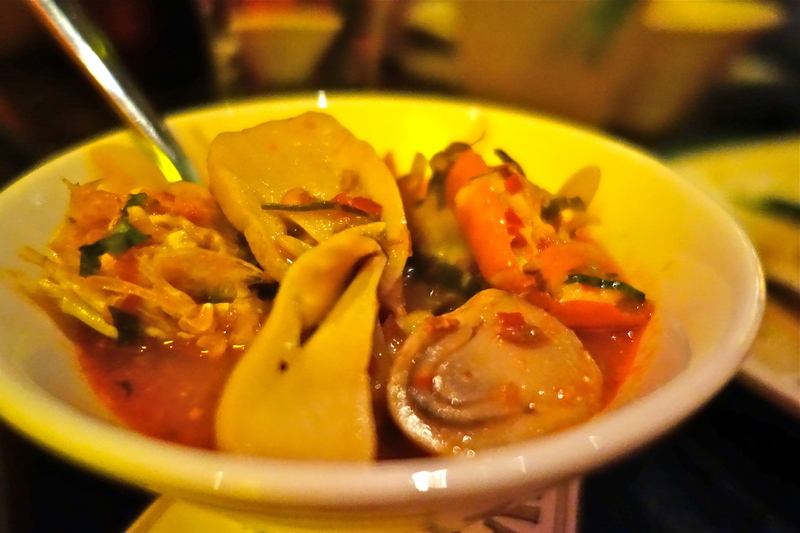 By these comparative standards, the Tom Yum Goong ranked quite highly on the scale! We shared one portion between the three of us, and it was jam-packed with flavourful ingredients – jumbo river prawns, mushrooms, lemon grass, chili. The prawns were served split in half, shell on – so if you don’t want to get your fingers dirty, it would be a bit awkward. My only other remark is that there were so many ingredients, but not enough soup. But would I order it again? Hell yeah. 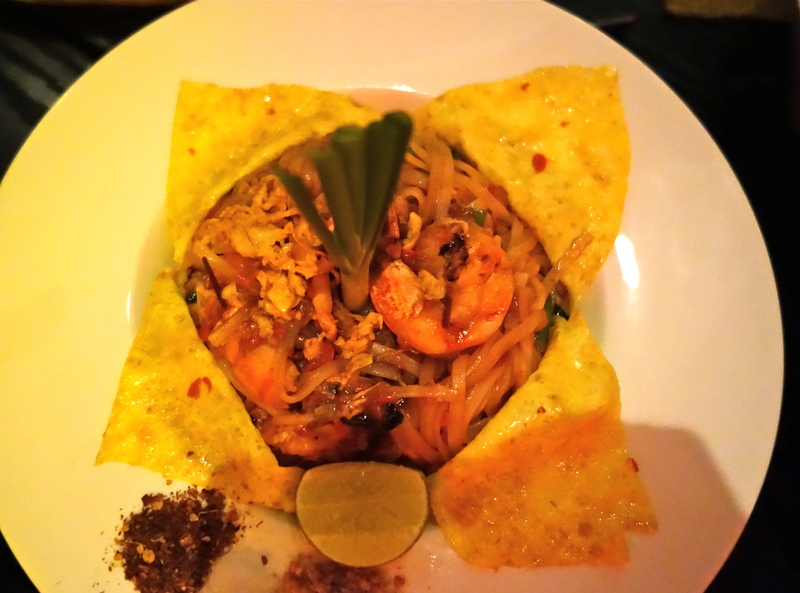 The funniest thing is, I am not a huge fan of Pad Thai, but I always order it in the hopes that one day, I will put a forkful of it in my mouth, and it will taste like that Pad Thai I had by the pool at the Penninsula Hotel in Bangkok – best Pad Thai I’ve ever encountered! Sadly, this was not that day. Whilst it was visually appealing, the noodles were far too heavy and sticky, the sauce too sweet. If you like a standard Pad Thai, then you’ll like this one! 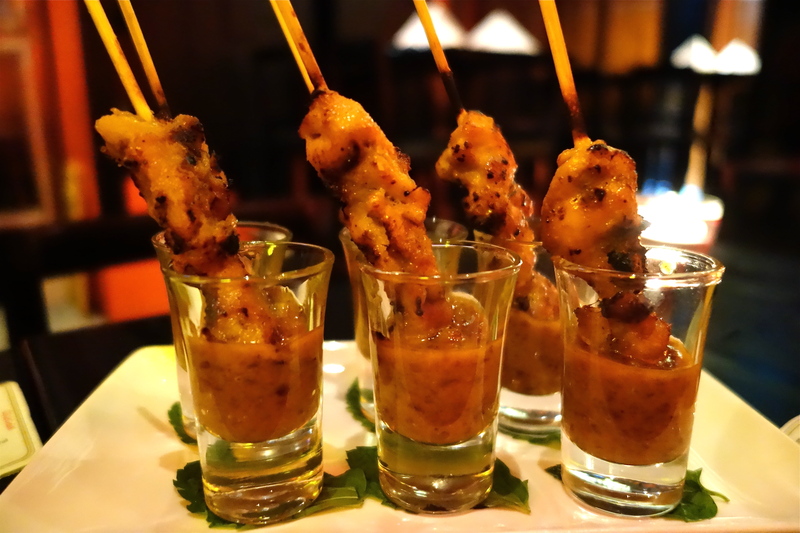 The Chicken Satay were very nicely presented in shot glasses, served with a wonderfully nutty peanut sauce. The chicken was moist and well-flavoured, making this dish one of my reasons to go back to Tangerine. The decor of the restaurant is a little bit more upscale compared to other well-priced Thai eateries that I frequent (Tuk Tuk Thai, Chili Club), and the food is ever so slightly more sophisticated than Koh Thai, making this a great place to go for a casual dinner. It’s not a big place and seats are limited, so definitely make a booking just in case. For us girls, it was the perfect place for a catch up with some (free!) cocktails and good Thai food, and we all said that it could become an addition to our regular dining scene. Price-wise, you really cannot beat it – we paid HK$499 for the 3 of us! Yes ladies and gents, a whopping HK$166.30 per person for dinner, in Soho! Check out all of their daily specials below, and perhaps, like me, be tempted to try Tangerine every day of the week!